"Walk Venice to savour and absorb its magic slowly!" You are about to walk Venice from your Venice port to the downtown area. Great! You are an independent and fearless cruiser. Or at least you wanna look like you know what you’re doing! No worries, as always, here at Mediterranean Cruise Ports Easy we have instructions on how to do it! Reaching downtown Venice is rewarding and personally, our favourite way of approaching the old lady. Venice is so much more than taking photos at Piazza san Marco or St. Marks square, turning around and going back to the cruise ship. Walk Venice to savour and absorb its magic slowly! Walking through its tourist-free neighbourhoods you can at least pretend as if it belongs to you, and you alone! On second thought, having a map isn’t crucial to walk Venice at all. It does help you get your bearings and put Venice into perspective… at least you’ll know which neighbourhoods you are walking through and what you’re seeing on your way. 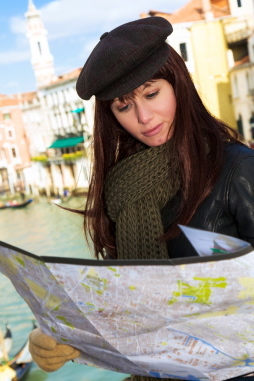 But, please, don’t make the mistake of burying your nose in your map as you walk Venice. check what’s behind that corner… maybe a secret garden or a little square with an old stone well in it! Sometimes, not even dedicated staring at a map helps… you’ll think with 100% confidence you’re walking through a certain neighbourhood and then in just a few minutes emerge out at a part of the town you never even thought of going to! So don’t try too hard… you can’t win. 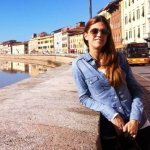 Relax, as one way or another, you will always end up at the beating heart of Venice, Piazza San Marco or St. Mark’s square! To make your walking Venice on foot easy, look for yellow signs on the corners of buildings. They either show you the direction of San Marco (St Mark’s square), or Rialto (on the way to St. Mark’s square). Those signs, combined with following the stream of people, will help you get to your destination. 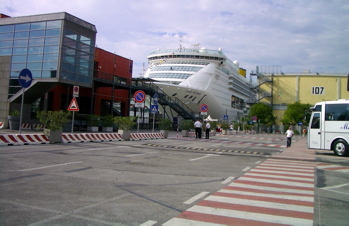 If you wish to walk back from Venice to the cruise ship, you will simply follow the signs to either Piazzale Roma or the Ferrovia (train station) which are right next to each other, so it doesn’t matter which one you follow really, you will end up at the same spot! When you walk Venice, the worst thing that can happen to you is to occasionally turn into some little dead end street that opens up at a canal. You cannot get much further than that as far as getting lost goes. Get off your ships gangway and ask the security for directions to get to the exit of the cruise terminal. Now keep in mind Venice port is very big and has many peers. Your ship could be anywhere between 2 to 10 minutes away from the central part of the cruise terminal complex and the exit. 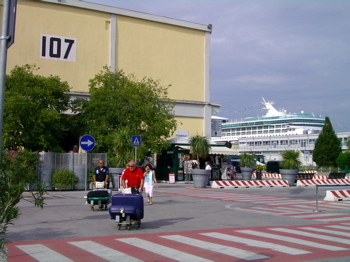 Anyway, look for the building no.107 which is close to the main hub of the complex, its entrance/exit, close to the taxi stop, the cruise line bus transfers to the airport and the public vaporetto station. Now turn your back to terminal building 107, and walk straight ahead. 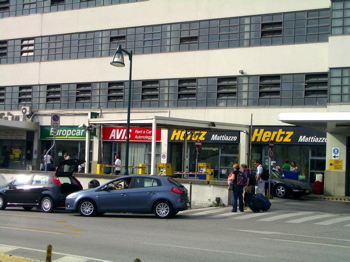 You will go through the Venice terminal entrance/exit and check point. 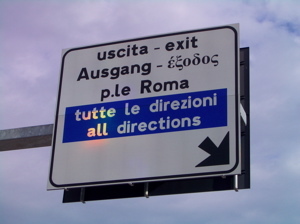 Follow the signs for exit out of the area and towards Piazzale Roma. Stay on the right hand-side of the road. When you get to the roundabout, keep on the right hand side. Be aware of the cars, as on this whole stretch there is no pedestrian sidewalk really. 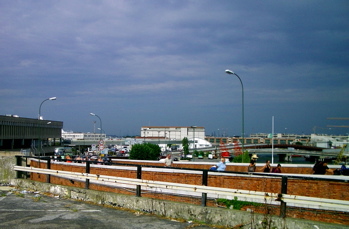 Continue walking up the "ramp" that connects the Venice terminal area with the highway that connects the mainland with Piazzale Roma. 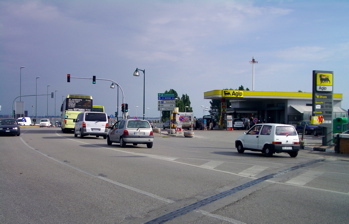 You will see the gas/petrol station in front of you. Now turn right and keep walking towards Piazzale Roma and its parking building. 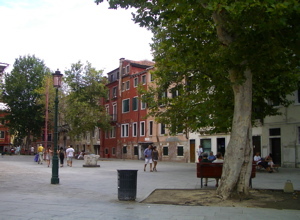 Here at Piazzale Roma you'll enter a more enjoyable area for walks in Venice, "the real Venice". These were the instructions for those that don't mind walking the dull part between Stazione Marittima and the Piazalle Roma. But guess what, thanks to the People Mover, a kind of an electric train that started operating in 2010, no one has to walk this dull little stretch. 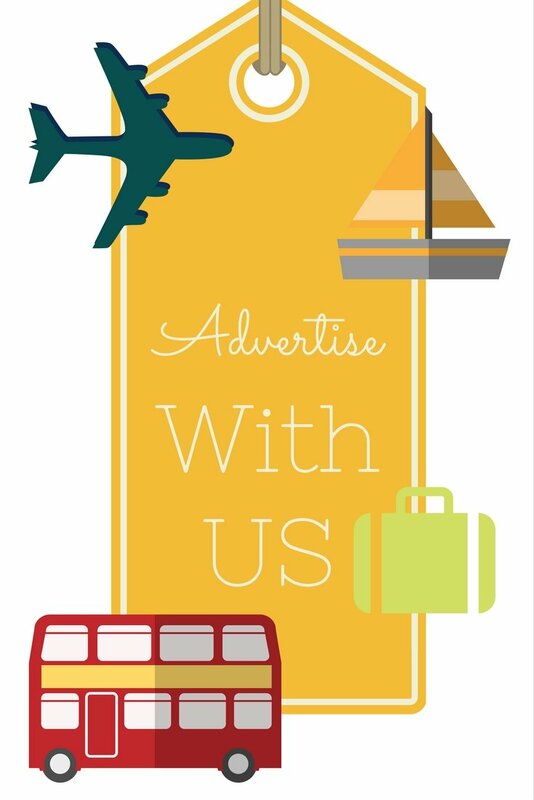 Find out more about it in our People Mover article. At Piazzale Roma will also be your first encounter with the Venice Grand Canal. In case you're taking a Venice vaporetto to reach downtown Venice, this is where you'll do it. 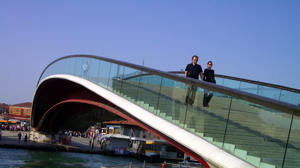 While here, make sure to take a photo with the (in)famous new Calatrava bridge, opened in the summer of 2008. Everyone has some opinion on it… you either love it or hate it! What’s yours? From there, you can either cross that bridge (which would take you to the train station) or stay on this side and go past the Giardino Papadopoli… there’s no right or wrong way, just follow the signs for San Marco and you’ll end up downtown Venice!